Neil Peart, drummer and lyricist for Toronto rock band Rush, is contemplating his favorite part of the eternal rock 'n' roll cycle. It'll begin, he says, in the next week or so. And it'll begin the way Rush's albums always begin. "We head off to our barn in the country to write. It's the most enjoyable part of the entire process for me. We work every day, just the three of us. And it's so intense, so creative, so rewarding. And the gratification is immediate." He'll ride to the barn as he rode into Toronto on the day we met - on a racing bicycle, unencumbered by the mysteries of internal combustion. "I'm a driven, obsessive person," he adds. "Studio work is an endless stream of inconsquential details for me and the repetition of the touring cycle wears me down. But out there in the barn a song can materialize in a single day, sometimes two songs. I love it." It may surprise Rush fans to know that the band, now in its 15th year, had no definite plans to reassemble after mixing sessions last summer for its four-sided A Show Of Hands, the trio's third live album. It was released a week ago and is already one of the 10 LPs most highly recommended for radio airplay by influential American music tip sheets. For the first time in all those years with his partners, bassist/keyboardist Geddy Lee and guitarist Alex Lifeson, there was no deadline of any kind hanging over him, Peart says. "We left it open-ended. We'd re-evaluate our feelings about continuing with Rush when we met at the end of the year. There was nothing looming, nothing on the horizon. Such possibilities!" Men of intelligence and wealth, Peart, Lifeson and Lee long ago came to terms with the notion that Rush didn't have to go on. Years ago it ceased being the vehicle that propelled the three men toward the realization of material dreams. Financially and artistically secure, they are free now to maintain the unit for purely creative reasons. Lee is learning classical piano, Lifeson composes movie and TV scores, and life has never been as full or as meaningful for any of them, particularly for Peart. "Age demands you broaden your horizons," he says. "Otherwise you become a caricature of yourself. I have the luxury of being able to indulge my interest in the world." A passionate traveller and seeker of wisdom, Peart set out in the fall on a bicycle journey across Cameroon and Chad in central Africa - partly to accumulate material for the novel or short stories he intends some day to write - and barely survived the effects of the crushing military presence in both places. "There were more soldiers in Chad than people. It took us six hours to get across the border, a little bridge between the two countries, because they're so suspicious of outsiders. In Cameroon soldiers almost confiscated my camera because I took a picture of a river and some trees. They're extremely paranoid." Lee took his family to a far more peaceful East Africa during the same period, Peart says. And Lifeson stuck around town, "playing and producing (Toronto pop band Clean Slate's debut LP). A third live album was a fairly risky proposition, Peart admits. "The first (All The World's A Stage) was too raw, and the second (Exit Stage Left) too refined; we'd lost sight of the performance qualities a live record needs. We were never happy with either of them. "We were well into the (1987-88) Hold Your Fire tour before we decided to do a third one, but to do it right. We checked for consistency against every possible reference, and I think we've actually succeeded this time in making even the ambience of the halls, the presence of the audiences an integral part of the experience." 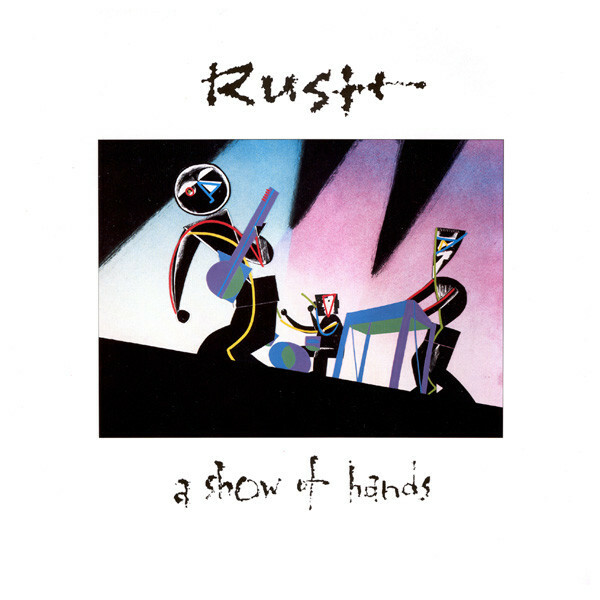 A Show Of Hands, comprising material mostly from the period following the band's ground-breaking, post-hard rock Signals album, is also something of a watershed for Rush, Peart believes. "This time we seem to be gathering around the guitar when we write, instead of keyboards and computers. It's not a reactionary idea at all; I think we've graduated succesfully from our technological phase. We're on top of it. "We've always been particularly single-minded about every phase we pass through, from acquiring technique, to songwriting, to arrangement and adapting technology. We had no idea we were moving on, of course. In the same way, I don't think, for example, that I ever fantasized about being in a famous rock 'n' roll band. I just wanted to learn to play drums, to keep time properly. One thing follows the other. "Fantasies are futile, self-defeating and frustrating. But dreams...dreams are beautiful, life-affirming, powerful. "We can't move forward without them."